If you haven’t reserved other accommodations for Fuji Rock this late in the game, I’m going to assume, much like myself and the bulk of the Fuji Rock attendees, you are going to be camping in the rolling mountains of Naeba! While this may sound as simple as pitching a tent, then wandering off to the festival to enjoy your weekend, allow me to suggest a few camping essentials that will make all the difference in your FRF experience. For this list I’m going to exclude obvious items like your actual tent or sleeping bag, as those go without saying (I hope). The list is purposely short as I want to get the conversation started. Are these 5 items essentials for you too? What else is on your FRF camping checklist? Read my list below then tell us what we missed. If you actually want to hang out and relax at your camp site, you’re going to need something to sit on. Bring a few camping chairs or stools for you and your crew and you won’t have to crouch in the potentially wet and muddy grass. Spending some time outside of the tent gives you the chance to socialize with neighboring campers, talk to people as they go by or just enjoy the open air of the mountains. Big or small, one or many, camping chairs are essential. This item is useful throughout Fuji Rock, but especially for campers. If you don’t have access to soap and water or are hanging back at the campsite chowing down, keep clean and sanitary. A small bottle of hand sanitizer will go a long way over the 3 days of the festival especially when things get wet and muddy. Whether you have something battery powered, solar, electric or just a hand fan, it’s going to be a big relief in those early mornings when the sun comes up at Naeba. The inside of a tent gets almost unbearable with the summer sun beating down. Give yourself a bit of relief and possibly a couple more hours to sleep or rest with a fan. This is another item that is good to have regardless. However, I can say from experience, if you are camping, you will encounter bugs. Whether you want those bugs crawling over you or biting you as you sleep is something I think most of us want to avoid. Along with sunscreen, keeping your body doused in bug spray over the duration of the fest will help keep your comfort levels high and itching to a minimum. You do want to actually make it back to your campsite, don’t you? 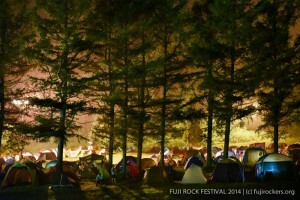 Fuji Rock is a massive festival, with thousands camping over the 3 days. While a light is recommended to navigate throughout the festival anyway, it becomes an essential item when you are camping. A smartphone flashlight won’t usually do the trick either. Make sure you mark your tent and have a powerful light to save yourself extra stress when trying to make it back to your tent at 3 am in a drunken stupor. If you’re a regular festival goer, you’ve certainly encountered the odd punter who couldn’t quite find his way back to his tent, either wandering aimlessly or passed out on the grass. A flashlight just might be the difference in spotting your tent among the sea of canvas. So there’s my five camping items I think essential, I’m sure there are loads more. Let us know some more in the comments section. What are your camping essentials? What did I forget from this meager list? Are things like tarps, rope, hammocks, and coolers essential items for you? Fuji Rock 2018 is fast approaching, so don’t wait until the last minute to obtain these items. Happy Rocking Fuji Campers!